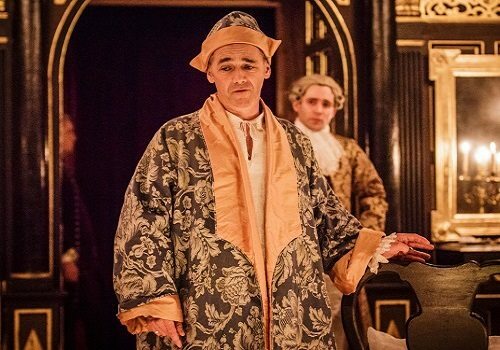 Claire Bam Kampen’s critically acclaimed production of Farinelli and the King starring Mark Rylance opens at the Duke of York’s Theatre following a sell-out run at the Shakespeare’s Globe Theatre. 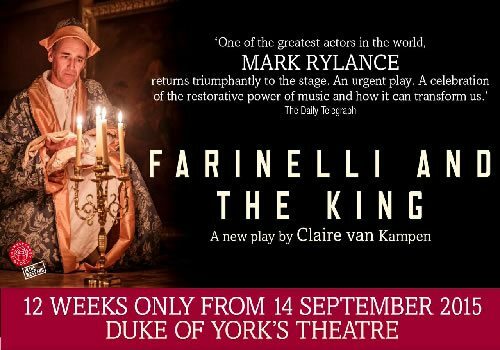 Farinelli and the King is a new play based on a true story which also includes some of the arias first sung by Farinelli, a celebrated Italian Castrato singer. The story is based on Farinelli’s relationship with King Philippe V of Spain who suffers deeply with insomnia. The dutiful Queen is so desperate to find a cure for her husband that she seeks out Farinelli, a singer with a voice so divine that he not only captivates all that listens, but may well be able to ease the King to a palliative state thus enabling him to find the rest he requires. The King is astonished by Farinelli’s skills, so much so that the King begs him to stay and work solely for him. This offer forces the singer into turmoil as he has to choose between serving his king and enjoying the fame and fortune of singing Europe’s beautiful opera-houses to captive audience. Will Farinelli choose fame and fortune or loyalty to his king and country? Mark Rylance will reprise his role as King Philippe V with Sam Crane as Farinelli and opera stars Iestyn Davies, Rupert Enticknap as Owen Willetts alternating the singing roles. Further casting includes Colin Hurley as Metastasio, Huss Garbiya as Doctor Jose Cervi, Melody Grove as Isabella Farnese and Edward Peel as De la Cuadra. Set and costume is designed by Jonathan Fensom. The show will feature live music from 6 onstage musicians and will brought to the audience amid candlelight. 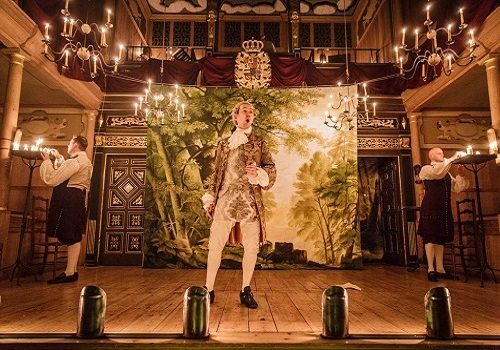 Farinelli and the King is brought to the stage by Shakespeare’s Globe and Sonia Friedman Productions, who join together once again after their sell out success with Richard III and Twelfth Night which also starred Rylance. Farinelli and the King is not aimed at children, however children over the age of 10 who wish to see the show may do so when accompanied by an adult guardian.